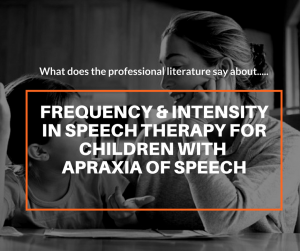 Children with childhood apraxia of speech (CAS) are often described as needing frequent and intensive speech therapy services in order to address the speech motor planning and programming issues that are at the heart of their speech difficulty. Typically, the need for speech therapy will extend over a number of years. Families and caregivers may need to advocate for the appropriate speech therapy services for a child with apraxia. Children with CAS who receive appropriate speech therapy are capable of making meaningful and substantial gains in speech intelligibility and communication. As their speech becomes more and more intelligible, the frequency of services can be adjusted according. Each child’s individualized needs and circumstances must be considered. In addition to their speech motor planning and programming needs, children with CAS often have other speech and/or language needs that need factored into therapy goals. For example, some children may also require training with augmentative communication devices in addition to speech therapy specifically targeting their speech production. Included below are the most relevant citations available in the professional published literature for communication sciences and disorders and in prevailing expert opinion that describe the need for frequency and intensity for children with CAS. Additionally, there are quotes and excerpts from the American Speech Language Hearing Association (ASHA). ASHA is the professional organization and licensing body for speech-language pathologists. “Given the need for repetitive planning, programming, and production practice in motor speech disorders, clinical sources stress the need for intensive and individualized treatment of apraxia, especially for children with very little functional communication. There is emerging research support for the need to provide three to five individual sessions per week for children with apraxia as compared to the traditional, less intensive, one to two sessions per week (Hall et al., 1993; Skinder-Meredith, 2001; Strand & Skinder, 1999). Ideally, this should be done in as naturalistic an environment as possible to facilitate carry-over and generalization of skills. Although home practice is critical for optimal progress, it cannot take the place of individual treatment provided by a speech-language pathologist who has expertise in motor speech skill facilitation. For the diverse backgrounds of children seen for early intervention, including their stages of psychological/emotional development, the Committee sees value in endorsing a treatment plan for optimum progress based on provision of intensive therapy. “Dosage refers to the frequency, intensity, and duration of service and the culmination of those three variables (Warren, Fey, & Yoder, 2007). Treatment dosage for CAS is consistent with principles of motor learning (McNeil, Robin, & Schmidt, 1997). Given the need for repetitive production practice in motor speech disorders like CAS, intensive and individualized treatment is often stressed. A number of research studies support the need for three to five individual sessions per week versus the traditional and less intensive one to two sessions per week (Hall et al., 1993; Skinder-Meredith, 2001; Strand & Skinder, 1999). For younger children, the frequency and length of sessions may need to be adjusted; shorter, more frequent sessions are often recommended (e.g., Skinder-Meredith, 2001). “The primary purpose of the present study was to explore the effects of treatment intensity on outcome measures for children with CAS undergoing motor speech intervention. A secondary purpose was to assess the magnitude of change as a function of treatment intensity across outcome measures in this population. Results indicate that both higher intensity groups (RND lists 1 and 2; tables 2 and 3) yielded significant results for changes in articulation (GFTA-2 standard score) and functional communication (FOCUS scores). However, lower intensity treatment (table 1) did not yield any statistically significant results. Importantly, there were no significant changes in speech intelligibility scores (for word or sentence level) across either treatment intensity. In general, higher intensity treatment produced large effect sizes for the articulation (GFTA-2 standard score) and functional communication variables (FOCUS scores) and moderate effect sizes for sentence-level speech intelligibility (BIT for higher intensity RND list 1; figure 3). On the other hand, lower intensity treatment yielded relatively smaller effect sizes than higher intensity treatment for articulation and functional communication, but for word-level speech intelligibility (CSIM) both lower and higher intensity (RND 1) treatments resulted in similar magnitude of effect sizes. For sentence-level speech intelligibility (BIT scores) only one higher intensity treatment group (RND 1) showed moderate effect sizes. Results of the study demonstrated that the outcomes of the high-intensity treatment were superior to those of the low-intensity treatment. Aravind Namasivayam Ph.D. S-LP(C)Childhood Apraxia of Speech (CAS) is in terms of diagnosis and treatment a very challenging and complicated speech disorder in children. Children with CAS find it difficult or impossible to accurately produce speech sounds and/or words despite having a good understanding of language. Although there are several treatment approaches for CAS, there are very few published studies examining their efficiency and effectiveness. For example, at present, we do not know the amount of change in speech intelligibility (the degree by which their speech can be understood by a listener) or their ability to communicate effectively in real world situations (i.e., functional communication) following treatment. We also do not know if more intense treatment (although promoted by most clinicians) is actually better for this population. Thus, there is a strong need for well-designed research studies in this area to advance clinical practice.In July 2011, the Childhood Apraxia of Speech Association of North America (CASANA) awarded a competitive clinical treatment research grant to Dr. Aravind Namasivayam of the Speech and Stuttering Institute in Toronto, Ontario, Canada. His team consisted of experts in the areas of CAS research (Dr. Ben Maassen, University of Groningen in the Netherlands), speech science (Dr. Pascal van Lieshout, University of Toronto in Canada) and speech disorders treatment (Ms. Margit Pukonen from the Speech and Stuttering Institute, Toronto, Canada). The CASANA funding was used in support of the research project titled “Exploring the Relationship Between Treatment Intensity and Treatment Outcomes for Children with Apraxia of Speech”. Using the funds from the CASANA grant a specialized screening tool was developed to identify a subpopulation of two to five-year-old children, who demonstrated characteristics of CAS, from a larger database of 102 preschool age children with motor speech issues. All children received a specialized motor speech treatment program delivered by qualified speech-language pathologists in one of two possible treatment formats: high-intensity (2 times a week for 10 weeks) or low-intensity (1 time a week for 10 weeks). Each speech therapy session lasted for 45 minutes. The speech-language pathologists providing the treatment were randomly assigned to either of these treatment formats. A child’s ability to correctly produce speech sounds in words, speech intelligibility and functional communication were evaluated both before and after treatment. Speech intelligibility was assessed at the word-level (percentage of words correctly identified by a listener) and at the sentence-level (percentage of words correctly understood in imitated sentences by a listener). Overall, the results of the study demonstrated that the outcomes of the high-intensity treatment were superior to those of the low-intensity treatment. Specifically, high-intensity treatment resulted in a significant change in a child’s speech production abilities, word-level intelligibility and functional communication when compared to low-intensity treatment. Furthermore, high-intensity treatment produced almost twice the amount of positive changes and had fewer children failing in treatment (i.e. not showing any real progress- especially for speech production) relative to the low-intensity treatment. However, neither high- nor low-intensity treatment improved sentence-level speech intelligibility in children with CAS. This CASANA funded study represents the largest data set available to-date relating the amount of therapy induced change and treatment dose and its effects on speech intelligibility and functional communication outcomes in children with CAS. The results from the study could be used to set appropriate levels of clinician and parental expectations prior to treatment and could potentially guide clinical practice (e.g. amount and possibly type of treatment required for this population). Importantly, even though positive changes were found for speech production and functional communication in CAS children with 20 sessions (2 times a week / 10 weeks) there was only minimal improvement in sentence-level speech intelligibility following treatment. Thus, the CAS children may benefit from more than 20 sessions of therapy and from a treatment program that systematically builds in practice of speech production targets in longer utterances (i.e. phrases, sentences, connected speech). At present additional analyses are being carried out to identify factors contributing to positive outcomes in children with CAS. For example, we ask which of the following factors affect a child’s treatment outcomes: child’s participation in the therapy process, amount of home practice and/or quality of parent-child interaction? With further analysis, we will be able to identify key factors that contribute to positive treatment outcomes in children with CAS and thus make a significant contribution to future clinical practice in this area.